Is anyone successfully using both; 1) content: Subject and 2) note: Body with Gmail > IFTTT > Dynalist? I’ve tried without success we well. It works fine from terminal so the API is working for simple text notes. Maybe there’s just too much crap in a IFTTT gmail body. Like it needs to be one line of ASCII to be safe. Who knows what it’s sending but the API is probably rejecting whatever it is. I’m actually quite curious - what is the use case for e-mail add to inbox? Either I am at my machine with a web browser or on the go with the Quick Dynalist Android app - when would writing an email be faster? Probably not faster, just more complete. Multiple itineraries and confirmations for travel plans are an obvious choice to simply forwatd into Dynalist rather than copy and paste information. For me, I would forward emails related to a sales business I am a part of. Being able to take notes on the specific information in those emails, or track converations in a CRM style fashion is way more productive than bouncing between other apps. 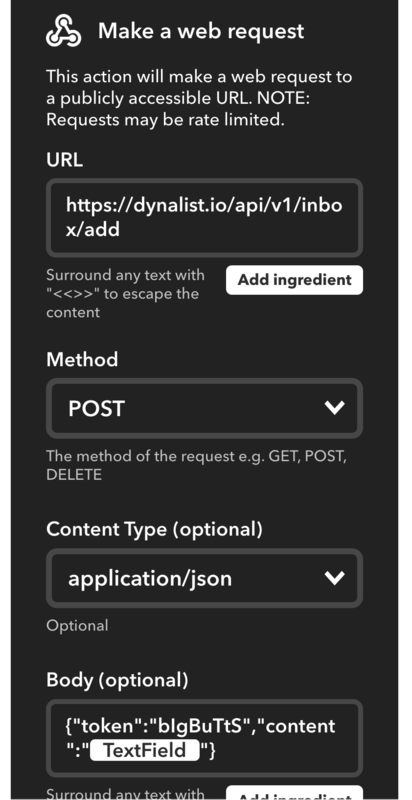 The feature request was made before the API released and before quick dynalist app existed. People planned to jerryrig an API thru email, since it’s a universal share method. Now that an API was released, email is just a euphamism for anything you can get into IFTTT. Use the <<<*>>> brackets to escape the text content. IFTTT probably is grabbing some encoding or html in the email that is causing the failure. I just set this up for a handful of emails with success. Anyone tried making this into an IFTTT widget? Replying to keith - Nope. This doesn’t work either. The applet runs but nothing shows up in inbox even for simple text emails. I’ve done it a number of times, Robert, both in IFTTT and Zapier. If you’re using IFTTT, make sure you use THREE <<<>>> not just TWO <<>>. Here is the ‘body’ section pasted exactly. You’re using the wrong quotes symbol. Not sure it matters to dynalist, but good habit to only use " not ”. Also this thing works for you right? API token is copied correctly? Inbox in DL is set properly? I have tried every method suggested. No luck! After entering content=textfield i couldn’t save the applet at all! I am sure i have entered all parameters right. I’ll try with the terminal. Thanks for all the help. It shouldn’t matter that i am using outlook.com as my email provider instead of gmail right?! As long as that is the email registered to the IFTTT account. Is that the problem? Robert you’re leaving out info. Screen shot the whole ifttt receipt. What’s your trigger? If your trigger is “email” then you are sending an email to a @ifttt.com address. It doesn’t matter where it comes from. 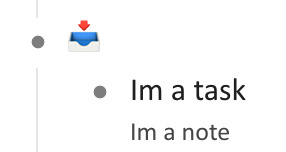 If your trigger is “Gmail” then you log into your Gmail. If your trigger is Google Assistant then nowhere is email used. I’m sorry, George. You’re right. There is another thread floating around about sending emails into Dynalist. This one is kind of a hodge podge of a few choices. I’ve been mixing the two of them up so I apologize if I’m leading anyone astray.